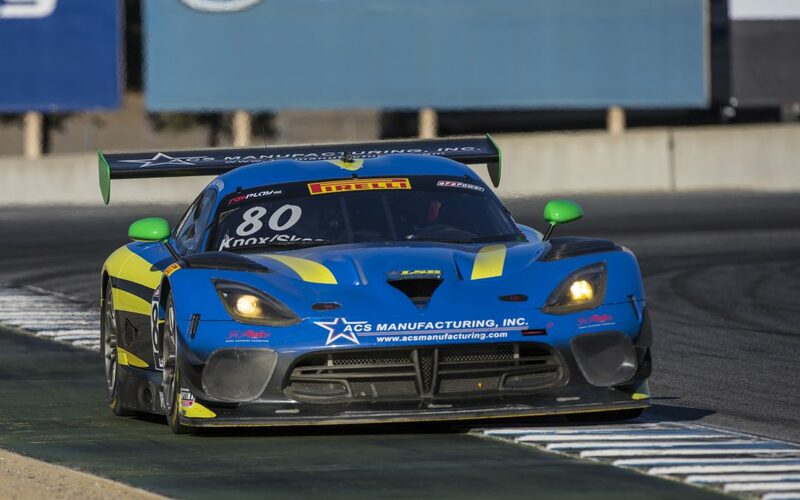 MONTEREY, California (October 8, 2016) – Dan Knox, Mike Skeen and Lone Star Racing finished a close second in the No.80 ACS Manufacturing/Lone Star Racing Dodge Viper GT3-R Saturday at Mazda Raceway in the team’s Pirelli World Challenge SprintX debut. Gridding from the inside of row five after qualifying ninth on Friday, Knox began the team’s charge to the front from the drop of the green flag, improving four positions at the race start. Knox raced in the top five throughout his stint before pitting with the rest of the GT-class race leaders as the field prepared for a restart after a mid-race red-flag period. The Lone Star Racing crew took over from there, putting Skeen in for Knox and getting the Viper out of the pits in second place after a flawless stop. Skeen quickly went to work on the first-place Porsche, passing for lead on lap 27 with just under 14 minutes remaining. The No. 80 held the lead for the next eight race laps until the race-winning Audi edged by with just over two minutes and two laps remaining in the race. In addition to debuting in the new-for-2016 SprintX class, Lone Star Racing was competing in World Challenge for the first time since Road America in 2015. Lone Star will double up on races in Sunday’s final day of Pirelli World Challenge competition at Laguna Seca. “We are running Mike in GT and then we will run SprintX again as well,” Petersen said. “We are just going right back to work. We will take what we learned from the time on the track to dial the car in some more. Historically, this track is not the best for the Dodge Viper, so we have our work cut out for us again tomorrow. Skeen wants one more step on the podium in each of tomorrow’s races. Sunday’s 50-minute GT race is scheduled to start at 1:05 p.m. CDT with the 60-minute SprintX finale going green at 3:15 p.m. CDT.